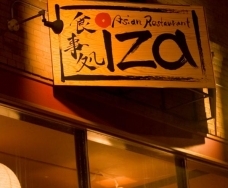 Iza was started in July, 2009 to provide a memorable Asian experience for our community. Using traditional Asian ingredients and local Montana products, we make all of our menu items from scratch and will never compromise by using MSG or other artificial flavor enhancers. You will experience real flavors from real ingredients. Our menu items represent countries such as Thailand, Japan, Indonesia, China, Malaysia, Korea, and Nepal. We have vegetarian and vegan options. Our name Iza comes from the Japanese word izakaya. Izakayas are traditional sake pubs in Japan that serve a variety of food alongside an abundance of sake. Neither a restaurant nor a bar, izakaya is a place where one can have delicious food and relaxing drink in a comforting warm atmosphere. We have beer, wine, and sake. In addition to our wonderful dishes, we have an expansive hot and ice tea menu including premium organic Japanese and Chinese teas. We are the first Missoula restaurant to offer Boba Tea (tea with sweet tapioca pearls), also known as Bubble Tea. Our unique Asian atmosphere, traditional scratch made menu items, and fantastic tea selection await you here in beautiful Missoula, Montana.